In poor weather conditions in Tuam Stadium on Sunday Alan Flynn’s Annaghdown side made a big impression when defeating Tuam by 2-15 to 1-6. Unlucky to lose to Corofin in last year’s semi-final, Annaghdown showed no ill effects, starting the game with both pace and power. 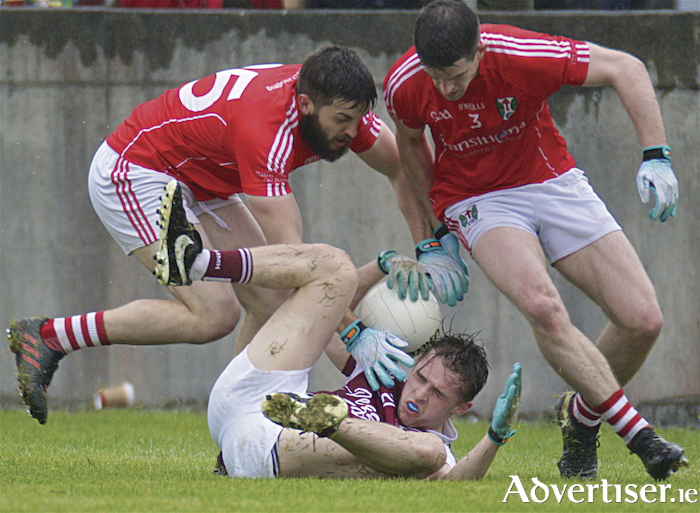 They quickly built up a 0-5 to 0-2 lead before two quick-fire goals really put Tuam on the back foot. A well-taken penalty from Frankie Burke, and a strong run and finish by county captain Damien Comer, left Tuam in big trouble. Even without starting the injured Eoghan Kerin, they looked much stronger in every area of the field. Jonathon Farragher mopped up everything around the back, while all of Tuam’s attacking threats were nullified for the majority of the match. County star Ciarán Duggan won his battles in midfield and Burke likewise on the inside line. Damien Comer switched between the full forward line and further out the field. Despite being away from goal at times, he still managed to bag 1-7, while Burke amassed 2-12 of their teams 2-15. Two worries for county manager Kevin Walsh for the June Bank Holiday weekend clash with Sligo (fixed for 3.30pm in Pearse Stadium ) will be watching a visibly injured Eoghan Kerins come on and then off again, and Comer having to leave the field with five minutes left after getting a kick to the leg. Corofin started their campaign for six in a row with an underwhelming, but efficient 10-point win over last year’s intermediate champions Claregalway. Resting Kieran Fitzgerald and Ciaran McGrath, the All-Ireland champions went with a younger team and never really got out of third gear. Even with the defeat, Claregalway will have been happy with their performance. It was their first game back in the senior ranks with a very young team, and their first ambition will obviously be to keep their senior status and to build on that. With a plentiful supply of exciting young talent coming through from last year’s minor team, Claregalway will be hoping to push on and become a force in Galway football over the coming years. Elsewhere in that group An Cheathru Rua defeated Cortoon Shamrocks by 2-06 to 1-07, while St James had a bye in the first round. Page generated in 0.0828 seconds.